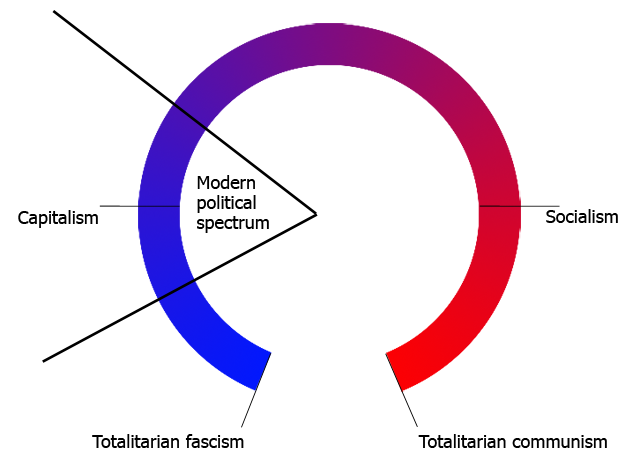 A little while ago I put together a graphic as a metaphor for just how much the political spectrum has shifted (specifically in the western liberal democracies) over the past few decades. This shift wasn’t started by Thatcher and Reagan, but they – and those who followed them – did most of the heavy lifting. The result of this shift was to effectively exclude the left-wing from mainstream politics, so that today, those who would once have been viewed as being centrists, are now the hard-left. Views that would label one as a moderate left-winger in the 1960s would – in the opening decades of the 21st century – place one firmly in the radical communist camp (and as such, essentially irrelevant when viewed from the mainstream). In my view, this shift has been tremendously damaging to the societies in which it has happened – and to western civilisation in general. By narrowing the discussion, we narrow the possibilities available to us. The result is a significant reduction in the amount of flexibility* within our culture. Thatcher, Reagan, their acolytes and fore-bearers quite rightly must shoulder a large proportion of the blame for this loss of flexibility and consequent social damage. But the blame does not lie entirely with them. Indeed an argument could be made that their role in this political shift was less influential than that of the leftists and centre-leftists who allowed themselves to be dragged – or in many cases, who willingly stepped – to The Right. And the fact that – for example – the Labour Party in the UK can still be described as “left wing” in the mainstream media demonstrates just how insidious this shift has been (it’s “the country’s leading left-wing party” according to The Guardian; a supposedly “left-wing” newspaper). This is despite the fact that some members of the Labour Party have denounced unions for “exert[ing] excessive left-wing influence” (source). At the same time, the party talks openly of its plans to “rescue capitalism” (source). When rampant capitalism plunges the entire world into major crisis, anyone who is genuinely “on the left” would be talking about ‘a new socialism’ or asking ‘how do we replace capitalism with something more just and sustainable?’ If your priority is to “rescue capitalism” then you are “on the right”. To suggest otherwise is ignorance. Or it’s propaganda. This shift to the right has, of course, not been restricted to a few places. Certainly there are exceptions (often significant ones… most notably in South America), but as a general rule it has swept across the globe and infected almost all so-called “liberal democracies”. Ireland’s socialist traditions were savaged by the Celtic Tiger, and the speed with which our own Labour Party dashed rightwards was undignified in the extreme. They almost kept pace with Tony Blair… and that’s saying something. Strangely enough though, our media appears to be slightly more perceptive than that of our British cousins, and it’s quite difficult to track down a recent example of the Irish Labour Party being described as “left-wing” in the mainstream media. Nonetheless, they are still described as being “centre left” by most political commentators and are still members of Socialist International and the Party of European Socialists. This ill-informed nonsense really needs to be challenged. When a member of Labour (or indeed one of their critics) describes the party as being “left” or “centre left” they should be robustly lampooned for the sheer absurdity of their utterance. They should be viewed in roughly the same light as a spokesperson for the North Korean regime who insists on describing the nation as the “Democratic People’s Republic”. Sometimes labels are important. And when the Irish Labour Party talk about being “a centre left alternative” they not only make a mockery of our public discourse, they actually damage the political fabric of the nation. How can people – especially younger people who have grown up with this new political spectrum – possibly understand political reality, and hence make sensible use of their political influence, when identical policies born of rampant capitalism are labelled centre-right by one party and centre-left by another? The Irish Labour Party was formed by James Connolly, William X. O’Brien and James Larkin… genuine revolutionary socialists. When I see the modern Labour Party’s annual Connolly Commemoration, it’s difficult to hold down the vomit. There’s a lot of “comedy of dubious taste” that I will admit to finding amusing. But this graceless charade is deeply unfunny, and they should really be required to stop it. If I were to visit Arbour Hill Cemetery every year to urinate on the grave of James Connolly I suspect I’d soon find myself behind bars. Why should Eamon Gilmore be treated any differently? Of course, these thoughts aren’t new to me (or this blog). But every now and then something will prompt them to bubble back to the surface where they must be vented, lest the pressure build up and blow the top off my head. Today that prompt was provided by Labour Senator, John Gilroy. In a single tweet, he illustrated just how far rightwards the Labour Party has moved since the days of Connolly, Larkin and O’Brien. The tweet came as part of a conversation between Gilroy and Michael Taft. Taft is “Research Officer” for the Irish UNITE trade union and is one of the most recognisable faces of the modern Irish trade union movement. Of course, just as with mainstream political parties, the Irish Trade Union movement has been a victim of the rightward lurch. Thankfully, they’ve not been dragged quite as far from their original principles as the Labour Party and haven’t been quite as eager to embrace selfish individualism and unfettered capitalism. Yes, they’ve all but abandoned any tendency towards militancy. And their opposition to the austerity policies imposed by – among others – the Labour Party with which they are affiliated, has been muted and ineffective. Nonetheless, Taft and others within the movement have at least continued to publish the data which demonstrates the truth behind government lies. Today for instance, Taft responded to the embarrassing nonsense emerging from the government on the subject of corporate taxation. For those who haven’t followed the story, it recently emerged that the largest corporation in the world (by certain metrics), Apple, “paid taxes of just 2 per cent on its foreign earnings”. It did this “by channelling much of its huge overseas earnings through a network of Irish subsidiaries to minimise its tax bill.” (source) In response to this revelation, the US Senate condemned Ireland’s status as a “tax haven”. What was the response of the Irish government? Well, initially at least, it hasn’t involved a promise to clamp down on corporate tax avoidance. Instead, we’ve had both coalition parties issue whinging statements insisting that Ireland is not a tax haven, and how dare anyone suggest otherwise. In fact, our government plans on writing a stern letter to the US Senate to that effect. They don’t really explain why Ireland isn’t a tax haven. I mean, they try of course; they talk about how US corporations actually employ people and manufacture things in Ireland, which is a far cry from buying a P.O. Box in the Bahamas. But while technically true, it’s misleading to the point of almost being a lie. Apple funnelled almost two-thirds of all profits earned in 2011 through Ireland despite less than 5% of its global workforce being employed here (source). So no, Ireland isn’t identical to the Bahamas, but in terms of tax policy, we certainly have a hell of a lot in common. And today Michael Taft ably demonstrated this fact with an article (Tax Haven Dictionary) on his website. It includes data to prove that Ireland’s effective corporate tax rate is far closer to the likes of Luxembourg and the Bahamas, than it is to places like France or the UK. This article then sparked a twitter conversation between Taft and the Gilroy (the Labour Senator). Gilroy’s final contribution to the conversation was to pose the question: “does the current tax regieme give ireland a competitive advantage?” If it hadn’t been typed, one imagines it being asked in a fairly triumphalist tone of voice. Now, Taft’s response to the question was: “Less than is imagined. Will be discussing that in an upcoming post.” However, I want to ignore that response (at least until Taft’s article is published) and concentrate on the question and what it implies about John Gilroy and the Labour Party in general. If you were to ask any one of the founder members of the Irish Labour Party, “what should be the prime motivation of Irish taxation policy?”, their responses would have all been along similar lines. “The redistribution of wealth with the purpose of reducing socio-economic inequality”. Pretty simple really. It’s a philosophy that underpins all genuine socialism, and – I would argue – is at the heart of any attempts to achieve widespread social justice in a large society. Taxation policy, therefore, is primarily designed with the interests of the majority in mind. By the 1980s however, “redistribution” had become a dirty word and the left wing – as part of their inexorable shift rightwards – had begun to describe taxation policy as a means to fund essential social services for those who could not afford them. Already at this point we see a major change in the mainstream left’s attitude towards taxation. It’s no longer primarily aimed at reducing socio-economic equality and is now focussed on providing a basic safety net to prevent the poor from starving or dying of easily-preventable illness. The rich can get as rich as they want so long as they chuck a few quid into the bucket to pay for minimal social services. Taxation policy by this point (in the eyes of the mainstream left, remember) is no longer about the interests of the majority and has become a question of accommodating the interests of a small minority while retaining enough of a welfare state to ensure corpses don’t start piling up on the streets. By the late 90s of course, the right wing was already begrudging society’s expectation of a minimal contribution from the rich and powerful. At this point the mainstream left could have salvaged a shred of dignity by standing firm, insisting that they’d already made a massive compromise in their wholesale abandonment of the social justice agenda, and The Right would just have to accept the obligation of the wealthy to allow the occasional crumb to fall from their replete table. Instead they simply bought into the right-wing agenda of rampant greed and the increasing concentration of wealth. So now we have a Labour Party Senator openly acknowledging that taxation policy can be justified by how well it serves the interests of large multinational corporations even if it is clearly not catering for the needs of the wider population. It’s obscene. And any vote for Labour at the next election is obscene too. Some might suggest that John Gilroy and his ilk are more concerned with the international competitiveness of Irish tax policy than they are with its fitness for purpose. But it’s a lot worse than that. John Gilroy and his ilk see Irish tax policy as perfectly fit for purpose. Because they see that purpose in terms of international competitiveness, not in terms of social justice. John Gilroy and his ilk need to be cast firmly into the political wilderness; they have no right to a place in our national discourse. Instead they should go work directly for the corporations they represent. Though I doubt they’d be considered competent enough to do so. * I am using the word “flexibility” here in the Batesonian sense; see: “Bali: The Value System of a Steady State” and especially “Ecology and Flexibility in Urban Civilization” (both in Steps to an Ecology of Mind, by Gregory Bateson). At its most basic, Bateson’s “flexibility” can be defined as “uncommitted potential for change”, and he argues that any reduction in this flexibility will have negative consequences on the ability of society to handle crises. Ultimately, if you reduce flexibility enough you will be left with a society that cannot cope with even minimal change without sustaining damage (up to and including finding its very existence threatened). In this sense, flexibility becomes a measure of the health of a society. Bateson also argues that as the flexibility within a culture decreases, there is a corresponding decrease of flexibility within the environment that sustains the culture, but that’s a discussion for another day. 4 responses to "Even the ‘centre left’ is on The Right"
Well not really, because it’s reasonable to see what’s leftwing today in terms of how the political spectrum looks today. You or I might not think of Labour as leftwing, but they are, when compared to the Coalition, regardless of where they stand in relation to Tony Benn or Nye Bevan. I understand what you’re saying ejh, but – with respect – I actually disagree on two fronts. 1. In the field of political philosophy / economics, there are policies which are objectively left-wing. And policies which are objectively right-wing. I’m not being hyperbolic when I suggest that the modern British Labour Party is not championing even one single genuinely left-wing policy. 2. The description of Labour as a “left-wing” party is not being done in a comparative fashion. The Guardian’s phrase; “the country’s leading left-wing party” does not come with any qualifiers. And even if it did; are we really going to describe the British Conservative Party as being part of “a left-wing government”? After all, it’s not UKIP, right? EDIT: I would agree with the comparative statement, “Labour is to the left of the Tories”. Just as I’d agree that “the tories are left of UKIP”. But I don’t agree with any statement that describes either as “left-wing”. Labour: Centre Right. Tories & Lib Dems: Right-wing. UKIP: tending towards the Far Right. A good word, “Ilk”. It drips contempt in a way that far longer words never could. I’ve seen the same old argument over and over again so many times. In essence, if you have principles, nobody will vote for you. Or so they’d have you believe. In essence, if you have principles, nobody will vote for you. Or so they’d have you believe. Sadly Paul, I fear “they” may well be right about that.